Enjoy! Let me know how you like the conclusion! The baron emerged at the top of the stairs, the skeletal guardian following behind him. The guardian held its sword in one hand, and the chalice in the other. The pearls had lost their red glow to return to their original white luster. The chalice clearly had no effect on the undead. The guardian sheathed its sword, and then advanced towards Dirk. He backed away towards the wall, frantically searching for another exit. The staircase, blocked by the baron, was the only escape. As the guardian drew near, Dirk attacked. He kicked at the chalice, trusting his boot would protect him from its life-draining power. The chalice flew out of the guardian’s hand, ringing as it spun in the air like a clunky silver bell. The baron’s face was stricken with horror as the chalice flipped end over end. The cup’s vertical trajectory didn’t take it far, but as it landed with a hollow metallic thud, Dirk was ready. He kicked it again, launching it directly at the baron’s shocked expression. The baron caught it reflexively. Elated, Dirk waited for the chalice to work its terrible magic. The red in the guardian’s eyes flared like the sword. Dirk was quick with the dagger. It penetrated the creature’s emaciated neck–one of the few unarmored points of attack–before the monster grabbed his hand. There was no blood from its neck, nor even a flinch of pain. Dirk tried to twist the dagger as the creature slowly pushed his arm back. The dagger tip had caught on something, however. It was the thin chain to the amulet around its neck, marked with the “control” rune. Dirk twisted the blade to catch the chain along the edge as his hand was forced back. The creature pushed back, adding its own strength to Dirk’s to pull the chain taught. As the creature’s other hand reached Dirk’s throat and began to squeeze, the chain snapped, and the amulet dropped to the floor. The guardian instantly released Dirk, the red sparks in its eye sockets blazing. Turning to the wizard, it drew the sword. The blade illuminated the room in a brilliant scarlet glow. The undead creature struck with surprising speed, and the sorcerer instinctively held up the chalice as a shield. The blow knocked the cup from his hands, and the guardian continued its relentless attack on the chalice, rather than the man. “No!” Sontex screamed, but the chalice was already snapped at the stem. Three successive blows with the glowing blade tore through the soft metal of the cup. On the fourth blow, the creature staggered, but split the bowl of the chalice still further. It raised its blade for a fifth strike, but staggered backwards and collapsed onto the floor. Sontex fell to his knees. He no longer looked like the baron. His youthful hair bleached white, and his skin lost its tone and shriveled. The sorcerer’s eyes sank into his skull. He took one final breath before collapsing to the floor, his body imploding around his skeletal structure. Dirk nudged the guardian’s armor with his boot. The corpse rocked lifelessly. Dirk sighed with relief, and then slumped his shoulders as the realization struck him: Nobody would believe this story. Two hours later, when the guards finally came to find out what had happened to the baron, Dirk hid from them by pretending to be yet another dead body on the second floor. Just before he exited the tower, he took amusement at the distant sounds of chaos on the fourth floor, as the guards discovered the viper. Nice read now if Dirk was only this good at snuffing puss golums and cultists at the start of Frayed Knights, he would be awesome, well OK more awesome. Might have to bump FN up on the list to be played in light of this story rekindling my interest. I really enjoyed this, found myself looking forward to each post. Definitely interested in reading more of your writing. Thanks, Darius! I enjoyed writing it. It was nice to mix my two obsessions together. I’ve got a couple more stories seeing print this year (at least). I wish games were as fast to put together as stories. 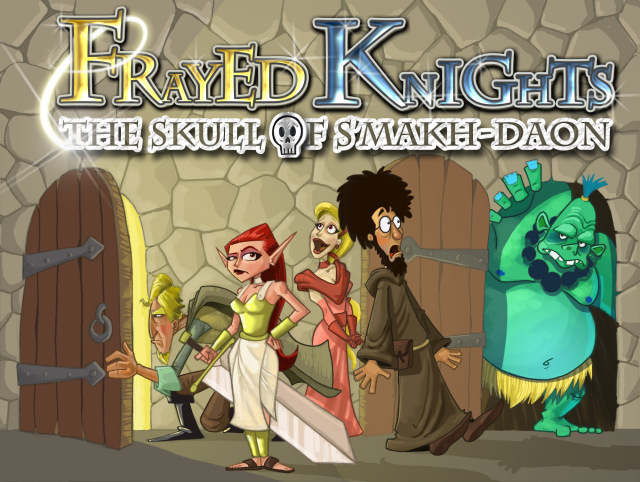 I think for the next few weeks, my Frayed Knights writing will actually be *for* Frayed Knights 2. FUN STUFF! Yep, T’was a good read :). Reminds me of some Conan stories of Howard (the good ones). Modran – I consider that a very high compliment. Thank you! This was a fun story! Thanks for sharing.